Inheritance of Skull Helmet from Skull Knight will be the birth of Berserker. 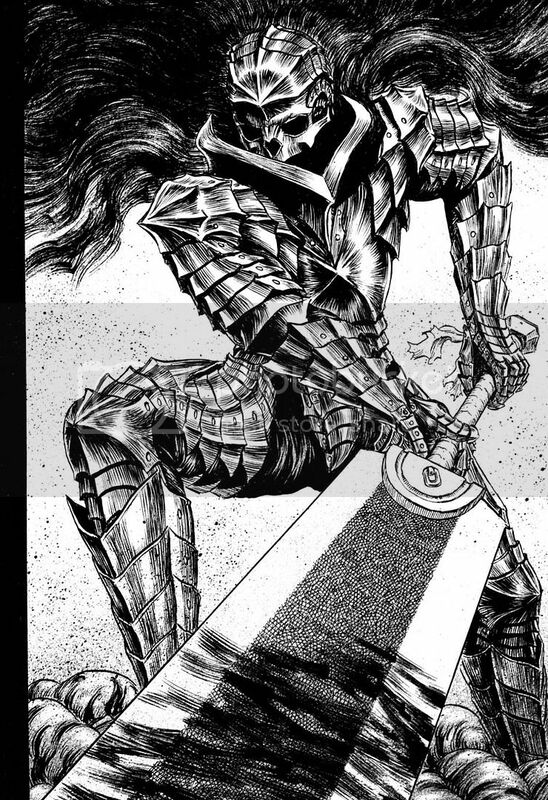 With the master of Schierke, an old friend of Skull Knight, due to enormous power the fetish of the Skull head is changed to a strong Skull helmet armor. This helmet is passed on to Guts who has been injured and is at the end stage of life. This scene is when the skull helmet armor is pass on to Guts which is the important armor that connects Geiseric and the Skull Knight. Guts wearing the skull knight armor are a protector, with the insertion of the armor in his body; his part of the body is changed and brings a major turning point in his life. After this, Guts is changed into “Berserker” which has gently increased his combat capability. We were planning in the production of the Berserk 20th Anniversary with Skull Knight face model since the beginning, however, we were unable to bring the balance in the armor for this modeling. With a long planning and the time, we finally are able to reproduce this master piece. 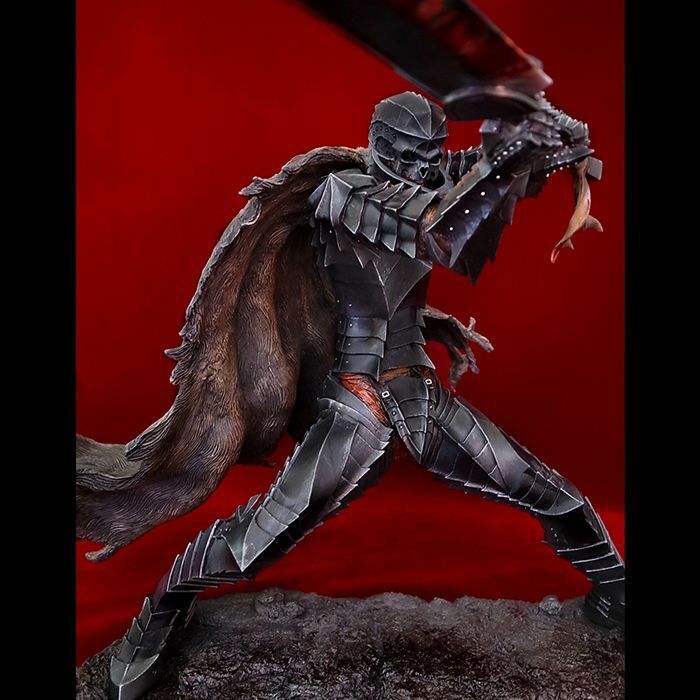 The modeling of the item is the turning points of Guts as a Berserker, where the body part of armor is taken from “Berserk 2015”. The skull helmet is a complete new modeling with a greatly improved mantle which shows strongest part of the turning point. In order to match the skull helmet with the body part, we have been repeatedly working with the modeling of this item for more than one and half year. Finally, we are able to present a complete modeling which looks exactly same and quite real. In the original appearance of scene, Skull head face is almost not seen. Therefore, it was difficult for in the modeling of the three dimensional models of Skull head image. This was done by modeling Guts wolf face several times. Finally, with many failure attempts in modeling the head part, we were able to reach to bring the exact original scene of manga in product. In addition, the features of mantle are modeling it in a larger image than that release in the past by emphasizing the feeling of “wave motion” and “life form” modeling. The cloak of the Berserker not only brings the feeling of cloth, however, there is an interpretation of the living life such as “biological motion” and “uneven organic spread” by putting more thickness to the mantle. Also, this time, in comparison to the work of 2015, it clearly expressed the size and movement of the product. You are able to fully enjoy the difference by putting the wolf helmet and skull helmet in hand. 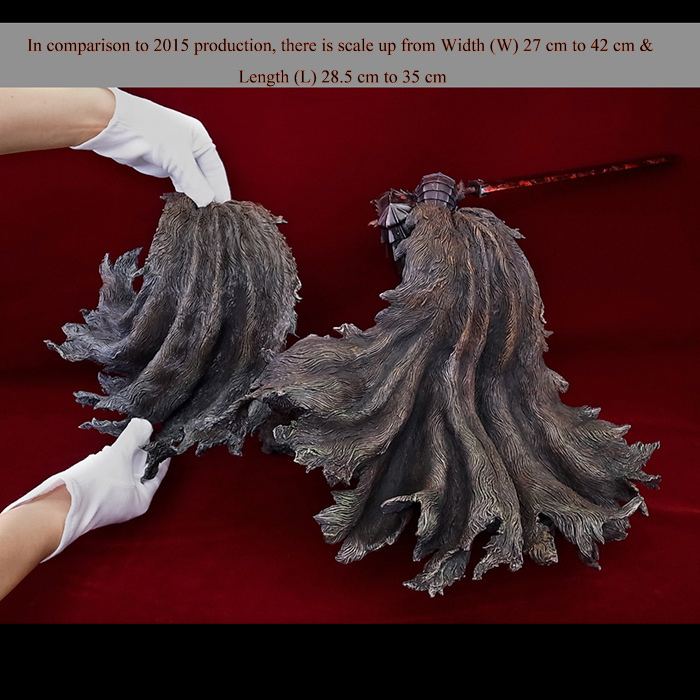 The whole items express comparative images of Armored Berserk, which persists top quality as that of statue of ART OF WAR. Price aside, not really compelling. Man they REALLY don't know what to do anymore. Its only me or this is totaly omg statue? Same pose like 20 th? New cloak ok but i do t like it, face ... Hmmm skullface no thanks. This is terrible......best part of it is, don't even have to buy this now if you're on the fence...plenty of repaints for this one to come I'm sure also. Pointless statue, how many more times will they use that same sculpt? Don't think anyone is going to grab this just for the cape or changed helmet. I'll be surprised if these sell out on pre-orders alone like in the old days. fool me 4 times, shame on you; fool me 5 times, shame on me. 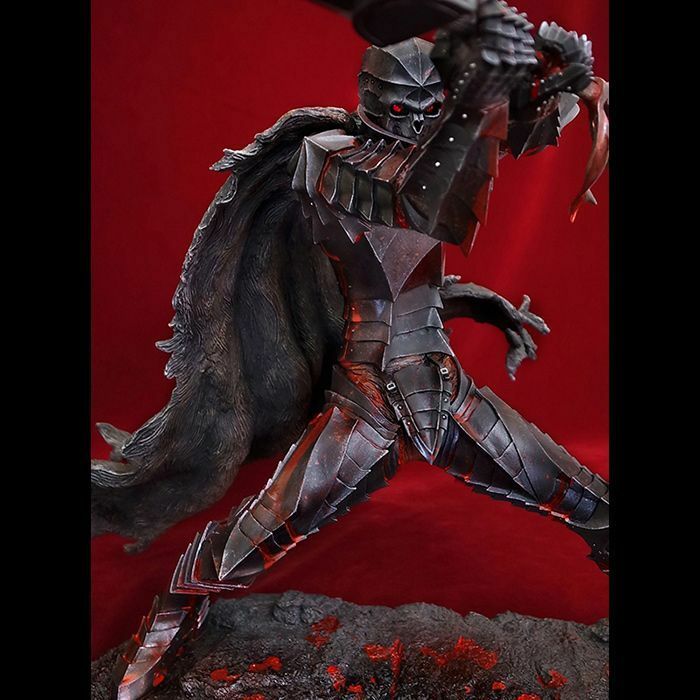 not gonna lie, for a second i was tempted to order this for the minor updates and the bloodless paint app (only one other version is completely bloodless)... but then i think about all the other awesome collectibles and statues on the market and realized the money can be directed to much better use. I think this figure will look extremely cool in total dark armour. Going to be sold out! Last i checked left 6 pieces. Hurry! Ok, now the the mantle is better and skullHelmet is the best, but the dragonslayer... It's too little!! 2 Pieces Left. Please take hurry!!! Coming up next: A version with extra large clown shoes and a nonsensical, boring and meaningless bonus character in a completely different size scale. Because why not? ...Sorry about that, just venting a bit. What page/book is that from? Volume 26, towards the end. You were joking... right ? Hmmm 1st time a 20th anniversary item not sold out. Maybe the skullface helmet not that attractive? You've got to realize that after years and years of reselling the same limited edition, even though each time the numbers are lower, people will eventually get tired of it. Beside, this is a pretty niche item (which shows they're running out of ideas). It appears on a total of 8 pages before the helmet takes its current shape, so while I find it cool, I can't blame people for not dropping a grand on it. About 9 pieces on the japan site and 4 pieces on international site unsold. They going to be sold as repaints shortly. Maybe its just me, but that statue's leg looks like it would be broken/should not bend that way. sigh.. why use the same post from 20th anniversary! it will be awesome if the sculpt is the scene from volume 26. This just my opinion. Well if you compare to 20th anniversary 2015ver. The armor is darker/ black for this ver. 2015ver is like silver color. The mantle is more majestic. Skull helmet looks amazingly similar to the picture too. I think is an amazing figure. I preordered it. Limited quantity available! Take hurry! Pre-order ends on June 14th, 2016!! Re-release of Armored Berserk:Skull Helmet Version*Bloody Repainting (with red crystal eye parts present)*Last 5 pcs. It is the same product of No.416, we will be able to offer the crystal eye parts with this item. We will put the two red crystals in the package of the item. Please kindly understand that we will not attach the red crystal in the eye ball of the Armored Berserk. We suggest our customers to put the red crystal eye by yourself. To the customers who has already purchased this item, we will be able to offer with the parts of two red crystal eyes. Please kindly contact us before June 3rd, if you wish us to put the two red crystals separately in a package. "Yeah so we've got some leftover stock we need to get rid of, so here's some $0.5 glass beads we're pretending are gem stones. We can't be bothered to set them in the sockets or adapt the statue though so figure it out yourself."